It seems I've always had a bit of a confused relationship with the colour orange - whilst I maintain that I don't really care for it - it's always called to me very strongly! As a youngster one of the biggest arguments my mother and I ever had was over a bright orange silk shirt that I desperately wanted! Fortunately, she won that battle! However, when I came home from boarding school to discover that she'd painted one of the walls in my bedroom bright orange, I had to hide my dismay and learn to live with it for more years than I care to remember! So here we are again, orange and I! It was a subconscious choice. This card started with some leftover drops of watery Brusho on my mat after I'd made some backgrounds. I already had the Just Add Color Designer Series Paper on my desk so it was just a natural progression to use a large brush to add the Brusho to the background of this strip of paper. In places my brush caught parts of the images but it didn't matter - those accidents turned into shading! Once it was dry, I coloured the images with Stampin' Blends alcohol markers, using the dark Bermuda Bay marker to add some shadows. I cut the word twice, once in Pumpkin Pie and once in Tangerine Tango, offsetting them slightly. 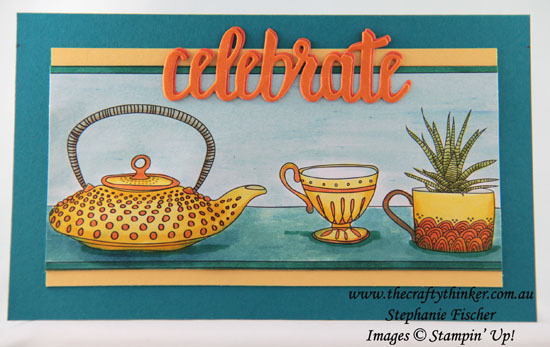 The Celebrate You die set is FREE during Sale-A-Bration with a purchase of $180. Click on the Specials & Promotions tag above for all the great offers and opportunities on offer until 31st March. I added strips of So Saffron cardstock to each side of the coloured panel and then mounted it on the Bermuda Bay base card. The base card measures 7 1/2" x 9 1/8", scored in half at 4 9/16.